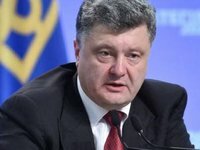 Ukrainian President Petro Poroshenko has said that a rocket attack on a bus carrying civilians near the town of Volnovakha was conducted by militants from the so-called Donetsk People's Republic. "Today's terrible tragedy near Volnovakha belongs to the events that stand out due to their cruelty even under strict standards of modern times. These events make blood run cold. Terrorists of the so-called DPR have carried out a rocket strike on the bus with civilians," the president said in his address to Ukrainians published on Tuesday evening. "Savages who have nothing sacred except devalued rubles killed ten civilians on purpose, 14-year-old girl among them. 16 men and women are wounded, all of them civilians. DPR-LPR gang and those who support it, provide armament, train and inspire for bloody crimes are guilty of these deaths," the head of state said. Poroshenko conveyed his condolences to the families and friends of the victims and put the tragedy near Volnovakha on a par with the recent terrorist attacks in the French capital. "I express my deep condolences to the families of those killed and injured at the hands of terrorists... The mass execution of people in Paris and Volnovakha – these are the events of the same scale. The civilized world must unite in the fight against terrorism," the president said. As reported, a passenger bus came under fire by militants near the town of Volnovakha, Donetsk region, on Tuesday afternoon. Twelve people were killed and another 17 suffered injuries in the attack. Ukrainian military reported that the shelling was conducted by BM-21 Grad multiple rocket launchers from the center of the rebel-controlled town of Dokuchayevsk.